A responsive, local help desk that picks up your phone calls the first time, and handles your problems quickly. That's the only acceptable help desk option. When your business is struck by a disaster, whether it is fire, earthquake, or electrical, having a disaster recovery plan that allows you to resume business quickly can save your business. Saving on infrastructure by sending services and data to the cloud can save your company. Analyzing appropriate items for the cloud is important and vital to your company's security. St. Louis Managed Services will allow your company to transfer day-to-day IT services to an IT company or managed services provider. Forward Slash Technology offers managed services and IT support to allow you to concentrate on your core business with fewer interruptions due to IT problems. We approach IT proactively to prevent downtime. With staff that is dedicated to your company and has extensive experience providing similar services to other small and medium sized companies, your business will receive IT on par with large corporations. To learn more about our IT managed services and to find out how our One Source Managed Services can fit your business needs, contact our IT company. As technology continues to advance, businesses are able to utilize technology more effectively in order to grow their business and improve efficiency. However, this can lead to a growing reliance on IT. Therefore, businesses can quickly become overwhelmed with the responsibilities of keeping up the IT infrastructure on which they depend in order to keep the business up and running. With IT managed services from Forward Slash Technology, we handle your important IT responsibilities and routine monitoring services allowing you to focus on your core business, allocating the personnel dollars you save to expanding that business. With our IT managed services, you can select which responsibilities you would like to hand over and which you prefer to keep in house. Services that we can handle include patch management, anti-virus / malware protection, and inventory reporting services. Command Line Access: With our IT managed services, we can remotely run an executable or trouble shoot an issue remotely without even interrupting you or your employees while using the machine. Event Viewer: With our IT managed services, we can access the event viewer remotely for any machine in order to view application, system, and security event logs. 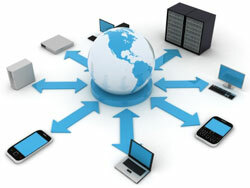 FTP Access: We can easily transfer large files to or from a remote computer as needed using our IT managed services. Task Manager Access: Our IT managed services allow us to trouble shoot any machine and access the task manager remotely if needed to shut down trouble processes or send a reboot command. Video, Voice, or Instant Message Chat: We keep our IT managed services and IT support personal accessible by offering video, voice, and IM chat when necessary. Finally, unlike many local IT managed services providers, our workstation and server support services are not only limited to Windows platforms. IT Managed Services though Forward Slash Technology are also available for Mac and Linux based systems. Whether you require help desk, infrastructure management or cloud computing, we are your provider for Mac managed services and Linux managed services. Our helpdesk staff are familiar with every operating system and can help you with day-to-day problems as well as larger issues. We are available Monday through Friday, 7 a.m. to 6 p.m., and are able to provide 24/7/365 support for those that require it. To learn more about IT managed services or our One Source Managed Services that are available to businesses around the country, contact our IT company. You can also learn more about the following IT managed services here on our website.